Are you aware that during the prohibition years in America , a popular chocolate bar was the “Vegetable Sandwich” which was manufactured by The now defunct Curtiss Company. The “Vegetable Sandwich” consisted of dehydrated sprouts, peas, carrots and cabbage coated in chocolate. Upon the wrapper written in bold letters was “Guaranteed not to constipate”! 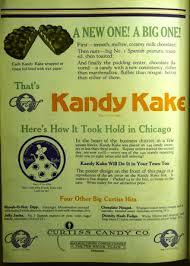 I was surprised to discover that it was rather popular, particularly with the residents of Chicago. Apropos nothing at all, just as New York is known as the Big Apple, Chicago is now known as the Big Cabbage; it has many layers, a hard heart and is full of wind. I wonder if this was because of the “Vegetable Sandwich”? Next PostLettuce, opium and chewing gum…..